Bill O’Reilly, a predatory slug who was fired from Fox News last year for being a predatory slug, is currently in talks to return to cable news, this time at Newsmax. In this world, you have to be much more than a predatory slug to keep people from flinging millions of dollars at you, because ratings. 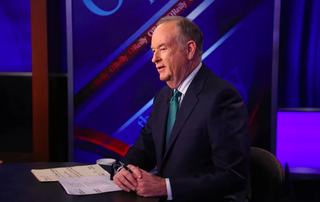 Page Six reveals that O’Reilly is in “advanced negotiations” with the network, which is also chasing fellow alleged slug Eric Bolling and former White House Whipping Boy Sean Spicer, as well as Greta Van Susteren. Truly, a lineup befitting these oleaginous times. Even a year after his resignation, news of O’Reilly and his attendant slimy behavior continue to surface. In March, former Fox News anchor Laurie Dhue filed a defamation lawsuit against O’Reilly after he wrote that her claims that he sexually harassed her were “fabricated in an effort to obtain a settlement.” She was the fourth woman to file such a suit, and one of six who settled harassment suits against him. Can’t wait to have him back. Why Do We Allow Terrible Men Redemption?